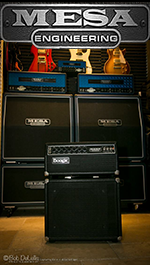 Great sounding amps and a great company from Northern California. Introduced in 1970, the Boogies proved to be absolute giant killers and began to re-define forever what a guitar amp could be and do. A small company working closely with leading players and fiercely dedicated to innovation and quality made a successful end-run around the sleeping giants of the industry. From the legendary “Holy Grail” of amplifiers, the Mark IIC+, to the Multi-watt Dual Rectifiers of the 2000’s, to the incredibly versatile Mark V, which includes every great feature of every great Mark Series before it, and now it’s little, brother, the Mark V 25, Mesa Engineering has the perfect amplifier for every situation. We’d like to thank Randy, Tim, Garey, Mike, Doug and everyone else at Mesa for their friendship and support. Bob’s favorite brand of guitars. There’s nothing like a 50s Les Paul, and the ’57 thru ’60 historic’s are the next best thing to the original. Bob’s favorites include a 2007 1958 R8 sunburst historic reissue, and a 2000 1957 R7 Goldtop historic reissue. These guitars are almost completely stock and they play and sound amazing. The combo of the Les Pauls and the Mesa Boogie amps create both a great crunchy sound AND can clean up, almost like a Strat. Great, great acoustic guitars. The Taylor Expression system sounds great and feedback playing live is a thing of the past. Bob plays both a T5Z Pro and a 512ce, which has a mahogany back and sides, an Engelmann spruce top, and a mahogany neck with ebony fretboard. This pairing yields a wonderfully refined tone: bright, crisp, clear, and responsive to the touch. Kurt plays a 514ce with a Western Red cedar top that brings extra warmth and responsiveness to their popular mahogany Grand Auditorium cutaway. Both guitars play and sound great and stay in tune for days. Our thanks to Bob & Tim at Taylor for their help and support. Kurt’s favorite guitars, and Bob loves them, too. The combo of Kurt’s Telecasters and Bob’s Les Pauls sound just awesome. Bob also plays numerous Strats for their extremely versatile sound and lightweight comfortable shape. The timeless features of Fender guitars have yet to be improved upon. Rapco makes great guitar and mic cables. Bob uses a various custom pedal snakes made by the guys at Rapco that are built to hold up to the abuse of touring for years. The snakes vary from minimalistic, multi-pair cables with only 1/4″ lines that are perfect for flying and keep the weight to a minimum, to other elaborate snakes that include cables, MIDI and even 120V AC power for his Voodoo Labs Pedal Power II power supply. Great sounding cables and so convenient to make a new cable on the gig in seconds.